경사지를 적극적으로 받아 들인 콘크리트 주거는 건축적 미학을 위한 장치로 스킵플로어를 사용하지 않습니다. 내부공간의 활용과 외부환경의 합리적인 결합점을 위해 각 레벨이 설정됩니다. 건물 내부에 위치한 중정은 리드믹컬한 내부 공간의 중심을 자연스럽게 연결하는 동시에 정제된 공간감을 제공합니다. 바닥에서 부터 천장까지 시원한 전창 또한 내부 공간과 콘크리트 구조물의 적나라한 구조미를 보여줍니다. Orthogonal concrete planes filled in with glass form this three-storey residence in a hilly area outside Guatemala's capital, by local firm Paz Arquitectura. Aylvalaan House is based on stacked rectangular volumes embedded into a slope near Guatemala City, with the majority of its front facade covered in floor-to-ceiling windows. 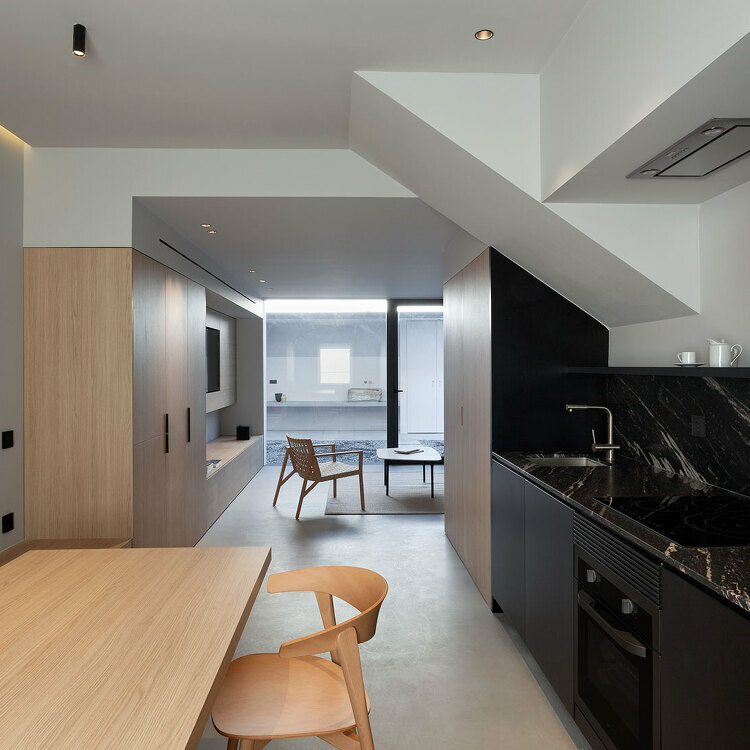 The main floor of the home is situated in the middle, with a lower level containing offices and social areas that meet a sloping backyard. The home is designed for a couple, with "Aylvalaan [being] the name of the street the couple lived during their first years together in Holand", said Paz Arquitectura from Guatemala City. Board-marked concrete forms the external walls, floors and roof planes – serving as the focal point of the design. Other industrial-style materials and features like stainless steel, ample glazing, metal window ribbons and exposed beams are all also used. An exterior portion of the ground floor is painted white to stand out against the concrete. Other surfaces such as floors, cabinetry, decking and stairwells are made from local, warm-toned conacaste wood. The floor plan of Aylvalaan House incorporates a series of lofted nooks and outdoor patios, varying from level to level. A massive wood door acts as a main entrance and rotates like a moving wall to transform the foyer into an open-air room.